The world famous fossil locality in the Dolžan Gorge above Tržič offers in inexhaustible wealth of various Lower Permian fossils. More than 80 species of brachiopods alone are known, of which over 20 were found here before anywhere else in the world, and had already been described and pictured by 1900. Karavankina schellwieni, from flesh-coloured limestone, was described in 1966. This new genus and species is characterised on the exterior surface of the valves by parallel belts that are strewn with tiny warts, the remains of small prickles. The animal was anchored with these in the limy mud of the seabed. Adult valves are about one and a half centimetres long and around two centimetres wide. Karavankina schellwieni Ramovš, 1966, lived about 275 million years ago in the warm Palaeotethys sea. The Lower Permian Karavankina schellwieni is a new genus and new species, differing essentially in its internal structure from the Lower Carboniferous species Productus elegans. The latter from Dolžan Gorge was described in 1900 by the German palaeontologist, E. Schellien. Professor Anton Ramovš has described fossil life in the Jesenice and Tržič areas in his popular science works, and we have obtained unique information on the formation of the Earth. Within the Tržič Society of Friends of, Minerals and Fossils, we decided to link these amazing finds to a trail which, in agreement with the Mountaineering Association of Slovenia, we have called the "Slovene Geological Trail". The expert guide to the path and daily control points produced by Prof. dr. Stanko Buser has become a valuable handbook for visiting this area. It is meant for students, scholars, scientists and all friends of the natural sciences at home and abroad. The trail leads one through the unspoilt nature of the Slovenia parts of the Karavanke and Julian Alps. It is around 1,500 kilometres long, and there are some 900 viewing points on it. The Slovene Geological Trail is the only project of this kind in the world, a geology laboratory in nature, a polygon for meeting scientists from all over the world. Dolžanova soteska, Dolžan Gorge, is a very important element of the Slovene Geological Trail, much visited by the world's scientists. 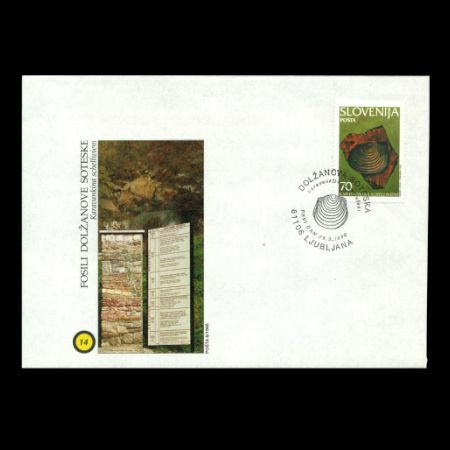 The issue of special postal stamps in a series of fossils minerals is a valuable contribution to understanding the natural wealth of Slovenia in the field of geology, palaeontology and mineralogy, and an enrichment of the world's philatelic treasury. 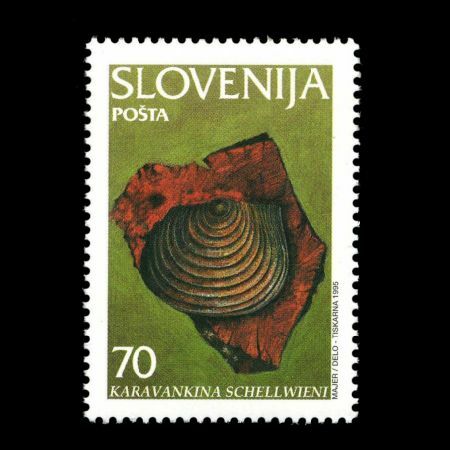 You, too, can become a member of the Society of Friends of Fossils and Minerals of Slovenia and visit the Slovene Geological Trail.